ECTN has been selected by the European Commission Directorate-General for Education and Culture (DG EAC) as a member of the ‘stakeholders committee for the European Year of Cultural Heritage 2018’ (EYCH2018). The selection by DG EAC followed a special call of the ‘Voices of Culture and Heritage’ in which 310 applications have been submitted and 35 stakeholder bodies have been selected, including ECTN. Other stakeholders include Europa Nostra and 16 members of the ‘European Heritage Alliance 3.3’. ECTN is the only selected stakeholder with a specific role on tourism, particularly on sustainable cultural tourism which is a target of the EYCH2018. The first meeting of the EYCH2018 stakeholders committee was held in Brussels on 28 April with the participation of ECTN. The key objectives, implementation, EU initiatives and funding issues were presented by policy officers of DG EAC and exchange of views followed, with comments and suggestions on outcomes to be achieved by the EYCH, key messages and target audiences, promotion of the Year and its activities and communicating with potential audiences. The meeting closed with ideas for cooperation with the Commission and the EY National Coordinators, as well as cooperation among the cultural heritage stakeholders. Promote cultural heritage as an important element of the relations between the EU and third countries. All of the above have a strong link with sustainable cultural tourism. New uses for heritage in terms of industrial heritage and religious/pilgrimage tourism. According to the above, ECTN can contribute to all of the above initiatives, which are also reflected in the ‘Charter for Sustainable Cultural Tourism’ promoted by ECTN. This contribution was stated by ECTN at the stakeholders committee meeting in Brussels and was welcomed by DG EAC officers and other stakeholders. There will be two further meetings to discuss further details about the action plan and ECTN will play an important role in securing the cultural tourism aspects of EYCH 2018 for its members and at pan-European level. ECTN took part in a high-level event organised by the European Parliament and UNWTO in Madrid on 24 March 2017. The event was closely linked to the 1st World Conference on Smart Destinations held in February 2017 in Murcia, Spain, and organised in the frame of the UN ‘International Year of Sustainable Tourism for Development 2017’. The concept of this event, “Connecting Europe through Innovation”, aimed to explore how to best stimulate innovation in tourism by connecting public-private initiatives and sharing best practices and how to assist European tourism SMEs through technology with positioning themselves and becoming more competitive in the global marketplace. Emerging opportunities were presented and discussed concerning the adoption of technology that would allow to enhance the sustainability of the European tourism sector and to meet the heightened expectations of the digital traveller. Speakers included Members of European Parliament, Claudia Tapardel, Co-Chair of the Intergroup on European Tourism Development and Cultural Heritage, Inés Ayala Sender and Cláudia Monteiro de Aguiar, Members of the Committee on Transport and Tourism, Ministers of Tourism Edward Zammit Lewis of Malta and Mircea Dobre of Romania, Deputy Head of Unit European Commission, DG GROW, Unit F4 - Tourism, Emerging and Creative Industries Iuliana Gabriela Aluaș and Secretary-General of UNWTO Taleb Rifai. The first theme was “Connecting Europe through smart mobility”, including the key challenges in connectivity and how these can be transformed into opportunities through the deployment of digital technology, the promotion of seamless mobility within Europe, and the positioning of Europe as an attractive destination globally. The second theme was “Assisting European tourism SMEs in navigating the digital landscape”, on how to empower European tourism SMEs to better take advantage of the opportunities provided by the digital market. The focus was around the challenges and opportunities regarding digital travellers. All of the above aspects are highly relevant for cultural and heritage tourism destinations in Europe. ECTN Secretary-General Manos Vougioukas had the opportunity to discuss the above issues with MEP Claudia Tapardel, the Romanian Minister of Tourism and UNWTO officers, particularly in relation to cultural tourism related requirements for ‘smart destinations’, a theme of the 2017 annual conference to be held in Sibiu, Romania, on 20-21 September 2017. Claudia Tapardel MEP, Co-Chair of the Intergroup on European Tourism Development and Cultural Heritage, as well as Dr Taleb Rifai UNWTO Secretary-General are invited keynote speakers at the ECTN Conference. The 1st World Conference on Smart Destinations took place at Murcia, Spain, co-organized by UN World Tourism Organization (UNWTO), the Spanish Ministry of Tourism and the Region de Murcia. This conference is in frame of the UN 'International Year of Sustainable Tourism for Development 2017', of which ECTN is an official supporter and participant. The 1st UNWTO World Smart Destinations conference is of high interest to ECTN, as it includes sessions on the new digital traveler, digital accessibility, innovation, management of cultural heritage sites, quality, visitor satisfaction, new visions, multi-modality, sustainability, resilience, creative destination, physical accessibility, tourism as a driver for development and sustainable management of resources. ECTN Secretary-General Manos Vougioukas was a delegate at the conference. The Smart Destinations themes are well in line with the ECTN 'Charter for Sustainable Cultural Tourism' and its priorities. Of particular relevance are the common themes of physical and digital accessibility, visitor experience, quality, sustainable mobility, creative tourism, cultural heritage sites as smart attractions, digitisation, innovation promotion, sustainability and economic development. ECTN looks forward to cooperating with UNWTO on current and future projects towards Smart Destinations for Cultural Tourism. ​A special session on Smart Destinations will be included in ECTN's 10th Cultural Tourism Conference to be held in Sibiu, Romania, in September 2017, in order to capitalize the key findings and outputs. ECTN joining the celebrations for the UN International Year of Sustainable Tourism for Development 2017! ECTN has joined the celebrations for 2017 International Year of Sustainable Tourism for Development (#IY2017), designated by the United Nations (UN) General Assembly and facilitated by UNWTO. Key area No 4 is of course of highest importance to ECTN, but the others are also of high relevance to sustainable and responsible cultural and heritage tourism development and promotion. The contribution of ECTN to celebrating #IY2017 is mainly in the form of sharing the “Thessalia Charter for Sustainable Cultural Tourism – Second edition”, launched in Brussels on 30 November 2016, which will be included in the #IY2017 website under ‘sharing solutions’. ECTN will also share all of our events and activities planned to take place during 2017, namely the annual Conference and Award contest to be dedicated to #IY2017, the thematic Workshops for the two Interreg Europe projects CHRISTA and Cult-RInG for which ECTN is responsible for the communication aspects. ECTN is proud to be one of the first international associations to actively take part in the celebrations of #IY2017, as the only pan-European network that provides the vital links between cultural values, heritage and sustainable tourism development! 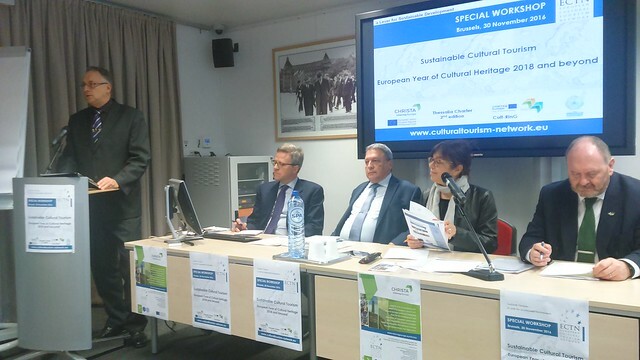 On 30 November 2016, the European Cultural Tourism Network (ECTN), Member of the ‘European Heritage Alliance 3.3’ and signatory of the ‘European Tourism Manifesto for Growth and Jobs’, organised a Special Workshop with the theme: ‘Sustainable Cultural Tourism, European Year of Cultural Heritage 2018 and beyond’. The event took place at EU Info Centre, Rue Archimède 1, Brussels (Schuman). This event was addressed to cultural heritage and tourism organisations and stakeholders to exploit synergies and cooperation opportunities regarding sustainable cultural tourism development and promotion in Europe, with emphasis on the European Year of Cultural Heritage 2018 (EYCH 2018) and EU co-funding programmes. Adam Bodor, Advocacy and EuroVelo Director, European Cyclists Federation. During the event, the enhanced and updated second edition of the ‘Thessalia Charter for Sustainable Cultural Tourism’ was launched, two ECTN Interreg Europe projects CHRISTA (Culture & Heritage for Responsible Innovative & Sustainable Tourism Actions) and Cult-RInG (Cultural Routes as Investments for Growth & Jobs) were presented and potential actions for sustainable cultural tourism were discussed related to the UN International Year of Sustainable Tourism for Development 2017, EYCH 2018, EU-China Tourism Year 2018 and EU co-funding programmes. Participants came from several national, regional and local authorities, cultural and tourism organisations, NGOs, cultural routes and other networks. “I am the founder of a partnership that focuses on 'Culture and Heritage for Responsible, Innovative and Sustainable Tourism Actions', working together as CHRISTA Project in the INTERREG Europe programme of Interregional cooperation, on priorities of intangible heritage, industrial heritage, interpretation facilities and innovations in digitization of heritage deployed for cultural tourism development and promotion. The CHRISTA Partners are destination authorities from nine EU member states, also including the European Cultural Tourism Network ECTN an international association based in Brussels, the only pan-European network that brings together the cultural and tourism sectors. CHRISTA is committed to support the European Year of Cultural Heritage 2018, as a unique opportunity in a lifetime to showcase and share our rich European heritage. We see our role as enhancing synergies of EYCH 2018 with sustainable cultural tourism. The Communication of 30 August 2016 makes several references to Sustainable Cultural Tourism, which we as CHRISTA and ECTN greatly appreciate, and we are ready to divert our actions with secured funding from ERDF to celebrate and support EYCH 2018, aiming to contribute to its success! The Commissioner for Tourism mentioned EYCH 2018 and we expect that Commissioner for culture will present more details about 2018 at the closing session today. In this respect, we are launching tomorrow here in Brussels a second edition of a CHARTER FOR SUSTAINABLE CULTURAL TOURISM at an event by ECTN, as our contribution to EYCH 2018. There will be speakers from the European Parliament, Committee of the Regions, European Commission DGs EAC & GROW, Council of Europe, EASME, European Travel Commission, Europa Nostra, European Cyclists Federation, and everybody is welcome. Our aim is to bring the cultural and tourism sectors together in preparing for EYCH 2018, also the UN International Year of Sustainable Tourism for Development 2017 which includes ‘CULTURAL VALUES, DIVERSITY AND HERITAGE’ as one of five key areas. Is UNESCO planning to participate in 2017 with UNWTO and 2018 with the EU? Raitis Sijats, President of ECTN, Chairman of Vidzeme Tourism Association (Latvia) signed Memorandum of Understanding and Cooperation with European Federation of Associations of Industrial and Technical Heritage (E-FAITH). facilitates co-operation in Europe between those engaged in these activities. ​The Memorandum aims at setting the guidelines for the cooperation between ECTN and E-FAITH, in order to enhance joint cooperation by pursuing active and fruitful formal relationships in the future. The Memorandum will provide mutual opportunity to have ever closer cooperation in the common topics, such as: make joint submissions to EU institutions on relevant matters and respond to consultations; organise joint events on themes of common interest and mutual benefit, undertake exchanges on cultural and industrial heritage tourism development and promotion; cooperate for the training of guides and interpreters of industrial heritage sites for visitors, support the European Union Institutions (Commission DG GROW Tourism, Emerging and Creative Industries Unit and DG Culture, the European Parliament Transport and Tourism Committee and Culture Committee, the Committee of the Regions and the European Economic and Social Committee), as well as jointly seek support from relevant European Union programmes, funds and initiatives. ECTN members participated as exhibitors at this year’s ‘World Travel Market’ (WTM) tourism fair in London’s Excel exhibition venue: Central Macedonia Region (Greece), Pafos Regional Board of Tourism (Cyprus), Granada (Andalucia, Spain), Burgas (Bulgaria), Sibiu (Romania), Ave & Alto Minhio (North Portugal), Bournemouth University (UK), were there. The ECTN Secretary-General Manos Vougioukas and Coordinator Ieva Treija visited the members’ stands and promoted the activities of ECTN to other destinations and institutions at WTM. ECTN representatives attended the World Responsible Tourism Day (WRTD) 10th anniversary events at WTM. ECTN and its previous project CHARTS INTERREG IVC had been official supporters of WRTD in previous years. The ECTN Secretary met UNWTO Secretary-General Mr Talib Rifai and Executive Director Mr Zoltan Somogyi and discussed about the inclusion of the ‘Siem Reap Declaration on Tourism and Culture’ of UNWTO & UNESCO in the second edition of the ‘Thessalia Charter for Sustainable Cultural Tourism’, to be launched by ECTN at the end of November in Brussels. ECTN expressed interest in the UN ‘International Year of Sustainable Tourism for Development 2017’ facilitated by UNWTO and offered to contribute to its success through Sustainable Cultural Tourism, also linked to the ‘European Year of Cultural Heritage 2018’. ​The ECTN Vice-President and Executive Manager of Pafos Regional Board of Tourism (Cyprus) Nasos Hatzigeorgiou attended the Workshop on the ‘The Phoenicians’ Route Cultural Tourism Programme’, where UNWTO and the European Institute of Cultural Routes (EICR) discussed pilot itineraries for the Phoenicians Cultural Route of the Council of Europe, in which Pafos is included. Further cooperation opportunities were discussed with the Phoenicians Cultural Route Director Antonio Barone and EICR Director Stefano Dominioni, also in the scope of the new project Cult-RInG of ECTN in the EU Interreg Europe interregional cooperation programme. The ECTN Secretary-General Manos Vougioukas also had discussions about potential cooperation with UNWTO’s ‘Silk Road Programme’, with UNWTO Officer for special field projects Nikolaos Gkolfinopoulos and TWISSEN’s President Francesco Redi. 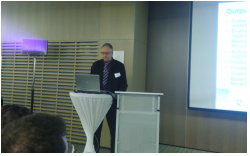 President of European Cultural Tourism Network (ECTN), Mr Raitis Sijats, addressed the Cultural Routes of the Council of Europe Forum, which took place at the Radisson Blu Hotel Lietuva from 26 – 27 October 2016 in Vilnius, Lithuania. This year`s forum focused on ‘Expanding the Cultural Routes of the Council of Europe: challenges and opportunities’. R.Sijats joined more than 50 speakers at the forum, coming from the national, regional and local authorities, certified cultural routes and candidates, academics, experts and tourism professionals, along with representatives of International Organizations and European Institutions. He spoke during the session entitled ‘Developing new themes and topics: Sustainable and cultural tourism’. Specifically, R.Sijats presented ECTN’s view on Cultural Routes and presented a new project ‘Cultural Routes as Investment for Growth and Jobs’ (Cult-RInG), in the Interreg Europe inter-regional cooperation programme (2nd Call), which highlights the value of investments in European Cultural Routes, in terms of their contribution to Growth & Jobs, with capitalization of good practices, policy learning, policy implementation, development of new Cultural Routes, monitoring and capacity building. The European Commission has published the awaited Communication (COM(2016) 543), regarding its proposal to the European Parliament and Council to designate 2018 as the European Year of Cultural Heritage (EYCH). The proposal includes several references to tourism, particularly sustainable cultural tourism. ECTN is looking forward to actively participate in the EYCH 2018, by providing the vital link between cultural heritage and cultural tourism. In particular, one of the three main objectives of EYCH2018 includes inter-alia ‘to promote sustainable tourism’, as well as ‘to underpin the cultural and creative industries and inspire creation’ and ‘enhance social cohesion and generate long-term employment’. Furthermore, one if the specific objectives is to: ‘encourage local development strategies that tap into the potential of heritage including through the promotion of sustainable cultural tourism’. Another specific objective calls for: ‘stronger interaction between the cultural and creative sectors and communities and the heritage sector’ and ‘promote heritage as a source of inspiration for contemporary creation and innovation’. All of the above dovetail greatly with the aims and activities of ECTN. Commissioner for Education, Culture, Youth and Sport, Tibor Navracsics, said: "Our cultural heritage is more than the memory of our past; it is the key to our future. A European Year of Cultural Heritage will be an opportunity to raise awareness of the social and economic importance of cultural heritage and to promote European excellence in the sector. I call on the European Parliament and Council to support our proposal and invite all stakeholders to help make this year a success." The proposal recognises that cultural heritage plays a strong economic role. Over 300,000 people are directly employed in the European cultural heritage sector and 7.8 million European jobs are indirectly linked to cultural heritage, for example in tourism. According to the Commission, the 2018 Year of Cultural Heritage will be an occasion to highlight the importance of European culture, and what the EU can do regarding conservation, digitisation, infrastructure, research and the development of skills. Events will be organised across Europe, as well as information, education and awareness-raising campaigns. It will provide an opportunity to seek answers to the challenges of decreasing public budgets in culture, declining participation in traditional cultural activities, environmental pressures on heritage sites, evolving value chains and digital transformation. ECTN and its members can contribute to and benefit from the above planned activities of EYCH 2018. The Communication acknowledges the role of the ‘European Heritage Alliance 3.3’ (EHA), of which ECTN is an active member, in facilitating the rich debate at EU level regarding policy developments on cultural heritage. EHA brings together relevant networks and organisations, coordinated by Europa Nostra. Alliance 3.3 refers to Article 3.3 of the ‘Treaty on European Union’ that states: ‘… the EU shall respect its rich cultural and linguistic diversity, and shall ensure that Europe's cultural heritage is safeguarded and enhanced’. ECTN greatly welcomes the EYCH 2018 and will strive to incorporate its activities into the EYCH programme. In particular, the Interreg Europe CHRISTA Project Interregional Workshops on Industrial Heritage in Goteborg, Sweden, and Heritage Interpretation in Sibiu, Romania, to be held during the preparation year 2017, will be enriched in the scope of EYCH and the Workshop on Innovation and Digitization in Latvia to be held in early 2018 will be included in the EYCH activities. Furthermore, the ECTN annual Conference (11th edition) to be held in September 2018 will be planned as an event within the EYCH framework and programme. The European Cultural Tourism Network (ECTN) has signed the European Tourism Manifesto for Growth and Jobs. ​European public and private tourism stakeholders have united and with a common voice have presented this Tourism for Growth and Jobs Manifesto. The document highlights the EU policy priorities for the sector in the coming years. ECTN is enthusiastic about this Manifesto due to the inclusion of 'preservation of cultural heritage' on the cover page, in terms of tourism benefits and stronger awareness of European citizenship, as well as explicit references to thematic tourism including culture, gastronomy and cycle routes, quality schemes including heritage, digitalisation, diversification, visitor economy, climate and job creation goals, local communities, visitor's experience, multi-modal mobility, connectivity, accessibility, holistic European approach, EU funding and integrated approach to the travel and tourism sector. ECTN is committed to all of the above priorities. ECTN is the only signatory of the Tourism Manifesto with a clear focus on cultural and heritage tourism. Furthermore, ECTN as an active member of the European Heritage Alliance led by Europa Nostra can provide uniquely the very important and vital link between cultural heritage and the tourism for growth and jobs, including the European Year of Cultural Heritage 2018 activities linked to sustainable cultural tourism. ECTN is very pleased to inform its members and associates that during the opening session of the bi-annual European Culture Forum in Brussels on 19 April 2016, Tibor Navracsics, European Commissioner for Education, Culture, Youth and Sport, formally announced that the European Commission will officially propose to the EU Council and the European Parliament a European Year of Cultural Heritage in 2018, following an exchange of letters between Commission President Jean-Claude Juncker and European Parliament President Martin Schultz. This announcement was followed by a powerful and engaged speech by Silvia Costa, MEP, Chair of the Committee on Culture and Education of the European Parliament. Silvia Costa has been one of the main supporters of the proposed Year within the European Parliament and is in close dialogue with all stakeholders concerned. The European Year of Cultural Heritage 2018 initiative had been actively supported and promoted by the European Heritage Alliance 3.3 (EHA), in which ECTN is an active member, led by Europa Nostra. Representatives of EHA had the opportunity to congratulate in person Commissioner Navracsics and MEP Silvia Costa immediately after their speeches on their decisive leadership and commitment to rallying the support of the European Commission and European Parliament for the proposed European Year of Cultural Heritage. EHA and Europa Nostra assured these high-level officials of EU Institutions that the civil society networks and organisations active in the field of heritage stand ready to contribute to the implementation of the European Year of Cultural Heritage in 2018 with creativity and energy. During the plenary session of the European Heritage Alliance 3.3., held on the eve of the European Culture Forum (18 April - World Heritage Day! ), at the Europa Nostra's Brussels Office with the participation of ECTN, we had a preliminary discussion on the main messages we hope to convey, the tools we intend to use, as well as the outcomes which we aim to achieve during the Year. ECTN looks forward to celebrating the future European Year of Cultural Heritage, with its members and partners, in close cooperation with EHA and Europa Nostra. ECTN proposes to provide the vital link between cultural heritage and sustainable tourism development, mobilising additional resources before and during 2018. In particular ECTN will propose to the partners of the new CHRISTA Interreg Europe project co-funded by ERDF that the project activities take place within the scope of the European Year of Cultural Heritage 2018, with EHA members as key stakeholders. ECTN fully shares this statement and congratulates EHA and Europa Nostra for this achievement. ​ECTN is ready and willing to make 2018 a great year for European cultural tourism! For the first time in the history of ECTN, a Honorary Member has been admitted, ​Ms. Androulla Vassiliou, former European Commissioner for Education, Culture, Multilingualism and Youth, for her important contribution towards the development and promotion of cultural tourism in Europe. The decision to nominate and admit Ms. A.Vassiliou as Honorary Member of ECTN was taken at the General Assembly held in Riga on 17th September 2015, as her international reputation goes without saying and reputation in Europe was certainly enhanced by her contribution at international conference ‘Cultural Tourism in the Experience Economy’ organized by ECTN on 25 October 2013 in Pafos (Cyprus), with an important video message. A special event for the award will be organized. The date and place will be announced in the near future. ECTN awards Honorary Membership to persons, who have been particularly distinguished in the field of cultural tourism. Honorary Members are not subject to membership fees and have an advisory function. ​At General Assembly, which took place in Riga on 17 September 2015, Intermunicipal Community of Ave Region/Comunidade Intermunicipal do Ave (CIM AVE, Portugal), was elected as a new member of the Board of ECTN. CIM-AVE is a governmental organization that administrates the NUT III level region, it is ruled by a Council of Mayors and a Chairman representing the 8 municipalities involved and roughly half a million people. As Public Regional Authority it has delegated powers from North Regional Coordination and Development Commission and have a rights to develop policies by itself, including tourism regulations and heritage visit rules. Kostas Chalevas, President of ECTN , President of EKPOL – Social and Cultural Council and Regional Councillor of Thessalia Region (Greece) signed Memorandum of Understanding (MoU) with the Network ‘Alpine Pearls’ – 27 municipalities across the alpine regions of Italy, Austria, Slovenia, Germany, France and Switzerland, to establish a strategic interregional and transnational cooperation in the field of sustainable and cultural tourism. 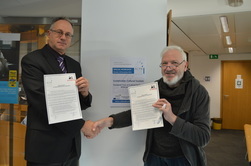 The MoU aims at setting the guidelines for the cooperation between ECTN and Alpine Pearls, in order to take advantage of the experiences of both networks for the implementation of common activities, exchange good practices and policy instruments and the developing of common EU projects in the field of sustainable and cultural tourism. The MoU will provide opportunity for Members – destination authorities of both networks to promote and exchange best practices of sustainable tourism, to support the developing of project ideas and lobbying activities in the preparation of EU projects, to be invited to the annual events and to response to relevant EU consultations for sustainable and cultural tourism development. In order to obtain direct information and learn about sustainable coastal tourism for economy for the creation of jobs and growth, as well as on promotion of Blue Growth, ECTN participated at the first ‘Pan-European dialogue between cruise operators, ports and coastal tourism stakeholders’, organized by DG GROWTH. As announced in action 3 of the Communication "A European Strategy for more Growth and Jobs in Coastal and Maritime Tourism", the European Commission promoted a structured dialogue on cruise tourism to enhance synergies in the sector, targeting best practice sharing in innovation, competitiveness, and sustainability strategies. During this event, 'cooperation' was the word mostly used throughout sessions as cultural tourism serves about half of cruise passengers and competition and cooperation should co-exist to guarantee sustainable cruise tourism for Europe. Commissioner Karmenu Vella announced that after this Conference will follow up the Dialogue at regional level, to go deeper into the specific issues of each region, to build on synergies created and to take forward the discussions on issues highlighted by this launching conference. More information. ECTN presented three initiatives on ‘industrial heritage’ from tourism perspective in Brussels, during the Start meeting of E-FAITH campaign 'European Industrial and Technical Heritage Year 2015', organised by E-FAITH: European Federation of Associations of Industrial and Technical Heritage. Initiatives of ECTN included the Annual Conference with open Call for Speakers, Award 2015 contest and new project idea for INTERREG EUROPE programme 2014-2020, where one of the theme is ‘industrial heritage tourism', as a result of INTERREG IVC project CHARTS. In order to continue seek for an opportunities to capitalize INTERREG IVC CHARTS project results and outputs after project ends, Coordinator of ECTN together with CHARTS Project Coordinator actively participated at the new programme INTERREG EUROPE launch event ‘Europe – let`s Cooperate!’, which was organized by Joint Technical Secretariat of INTERREG IVC programme 2007 - 2013. This event brought together policymakers and practitioners from all over Europe working in the four topics: research and innovation, competitiveness of SMEs, low-carbon economy and the environment and resource efficiency, as well as offered to meet staff of JTS, other regional / local authorities, agencies, research institutes, thematic policy organisations, representatives of relevant EU thematic networks and communities, INTERREG IVC project partners and stakeholders and other representatives from EU institutions working on the topics covered by the new Programme. Particular interest was on the topic ‘Environment and resource efficiency” which includes tourism, culture and heritage. The special workshop on this topic was attended, information and clarifications on the programme rules, partnerships, proposals and other obligations received. This forum offered possibility to networking with others in order to exchange project ideas, find partners and exchange experience. with invited representatives from non-members countries of ECTN - destinations or regional authorities, agencies and institutes from Austria, Croatia, Czech Republic, Denmark, Finland, France, Malta, Netherlands, Poland and Portugal. Around 29 persons came at the networking table with the great interest.